Here is a comparative view of illustrator Jed Henry's beautiful art and my family's marsh. Both graphics show the booming process. A tractor on either side drives down the dams, collecting the cranberries with the boom. The arm on the tractors used for booming sprays both air and water to push berries away from the edge of the bed so that the boom can collect them. This shows the picking process. On our marsh, we use a machine called a harrow. Each metal bar is bent in an "L" shape. 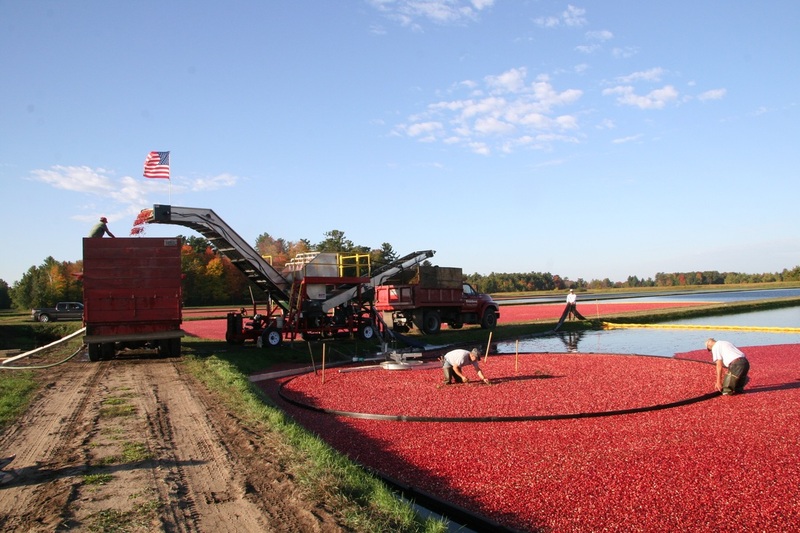 The short end of the "L" glides along the bottom of the cranberry bed, popping the cranberries off the vines. The workers shown walking in the bed are moving sprinkler heads so the harrow doesn't damage them. Sprinklers are used for irrigation and for frost protection. This photo shows the entire equipment setup for getting the berries out of the bed. The delivery truck is on the left, the cleaner is in the middle, and the "trash" truck is on the right. The two workers in the bed are corraling. In the bed, two spinning paddles push the cranberries into a suction pump and into the cleaner, where the berries are cleaned and separated. Good berries go up a conveyor belt and into the delivery truck and the bad berries and leaves go into the "trash" truck. Fun fact: good cranberries bounce, thanks to the four pockets of air inside. 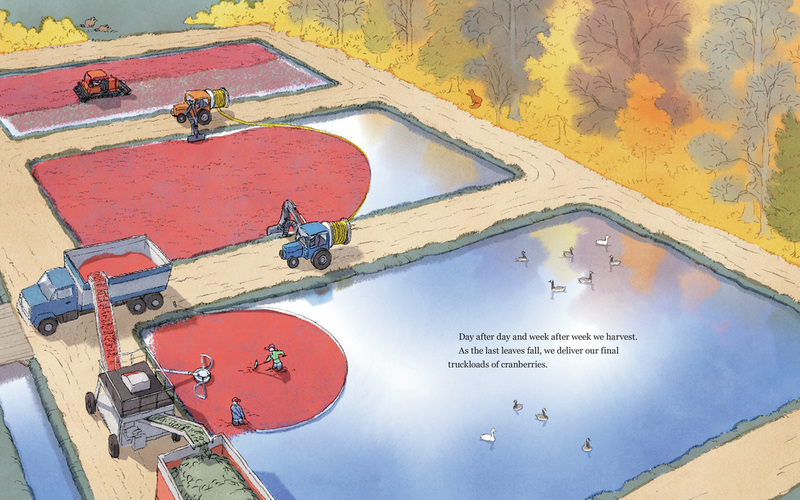 Here is my favorite illustration from the book - I love the bird's eye view of the harvesting process. Jed depicts picking in the top bed and booming in the middle bed. The lowest bed shows the same equipment seen in the photograph above. One of my favorite details that Jed added is the inclusion of the wildlife we see on our marsh. It's common to see swans and Canada geese floating in the water as Jed shows here. Throughout the book, you'll also see illustrations of foxes, raccoons, deer, and sandhill cranes. Fun fact: a cranberry blossom looks like the head and neck of a sandhill crane. That's how this tart red berry got its name. "Crane-berry" was eventually shortened to "cranberry". Illustrations on this page are copyright © Jed Henry. Photos on this page are copyright © Lisl H. Detlefsen.